PULLMAN, Wash. – Fifty-seven undergraduates won 51 awards for their research presentations at Washington State University’s annual Showcase for Undergraduate Research and Creative Activities (SURCA) on March 27. Nearly 225 students participated in eight categories. PULLMAN, Wash. – The sixth annual Washington State University Showcase for Undergraduate Research and Creative Activities will be at 3:30 p.m. Monday, March 27, in the CUB ballroom. Awards will be presented at 5 p.m. in the CUB auditorium. 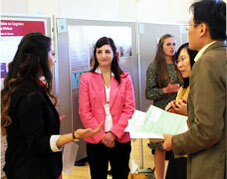 PULLMAN, Wash. – Faculty, staff and post-doctorates are sought to volunteer by the March 1 deadline to help judge the sixth annual Showcase for Undergraduate Research and Creative Activity (SURCA) at Washington State University. PULLMAN, Wash. – Providing opportunities to participate in research and creative activities marks a fundamental aspect of Washington State University’s commitment to provide undergraduate students with a truly transformational college experience. PULLMAN, Wash. – Online applications are welcome through Feb. 21 for student participants in the sixth annual Showcase for Undergraduate Research and Creative Activities (SURCA), which will be Monday, March 27, at Washington State University. PULLMAN, Wash.— More than 235 students, presenting just over 200 posters, landed a total of 51 awards at Washington State University’s largest-ever Showcase for Undergraduate Research and Creative Activities (SURCA) this week, according to Shelley Pressley, director of the Office of Undergraduate Research, which hosted the event. PULLMAN, Wash. – Wearable technology, zooplankton migration and mechanical pruning of apple trees are but three of more than 200 topics to be presented by students today at the fifth annual Showcase for Undergraduate Research and Creative Activities (SURCA) at 3:30 p.m. in the CUB ballroom at Washington State University. The awards ceremony starts at 4:45 p.m.
PULLMAN, Wash. – Abstracts from undergraduate researchers are due Feb. 22 for the fifth annual Washington State University Showcase for Undergraduate Research and Creative Activities (SURCA) on the afternoon of March 28 in the CUB ballroom. 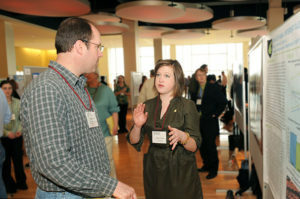 PULLMAN, Wash. – The 2015 Showcase for Undergraduate Research and Creative Activities (SURCA) at Washington State University broke many records March 30 – in participation, attendance and number of winners, awards and sponsoring donors.